Does it still make sense to do elopement getting ready photos if you’re having an intimate or laid back wedding day? I think the simple answer is yes, because no matter what type of wedding day you’re planning, there are great moments that happen at the start of it. From intimate candid moments to the opportunity to create amazing detail photos, the “getting ready” portion of your wedding day deserves to be included in your wedding story. Here are 5 reasons why you should have your wedding photography start earlier in the day. The hours leading up to walking out the door to get married on your wedding day are filled with some of the most emotionally charged moments. For this reason alone, I think it’s worth having me around to photograph these important moments. And even more importantly, the more intimate moments that unfold during this “getting ready” portion of the day blend beautifully with the rest of your coverage to show the full spectrum and journey of your wedding story. Also, if you’ll be staying somewhere special for your wedding day, then why not utilize it for cool photos as well? With some of the best hotels in the world, NYC has some really funky and cool spots to use for portraits while you’re all dressed up. I love it when couples get ready in the same space when eloping because it really stresses the intimacy of the day. While this almost never happens on big wedding days, the ability for the couple to be spending time together that usually has them sequestered from one another is really special. There’s even a way to preserve a little mystery and still do a first look! You can get ready together up until you need to get dressed, and then one partner will get dressed first and then duck outside, and then the other partner will get dressed. Once everyone is ready to go we can then go to do the first look. That’s exactly what I did with Natalie & Peter at The Whitby. If you really want great detail photos of your dress, tux, bouquets, invitations, and other significant items, then it’s important to have me there during the start of your wedding day. Selecting these items was not a light choice on your end, so capturing them with a bit of care makes for great keepsakes to look back on, even if you choose to sell the dress. Styling and capturing your details in a more interesting way is a breeze in a controlled environment like a hotel room, your own apartment, or an AirBnB rental. It also allows me to incorporate other details, like the row of family photos behind Johana’s floral bridal shoes. The rings are the only item that I’m used to capturing out and about in NYC, because this is the one detail photo I have to capture even if I wasn’t there for getting ready photos. Rings, however, are small objects that are easy to pop on and off, and it’s usually easy to find some interesting texture or surface to place them on to photograph. Whereas asking a bride to take off her shoes to photograph them is kind of…an odd request. 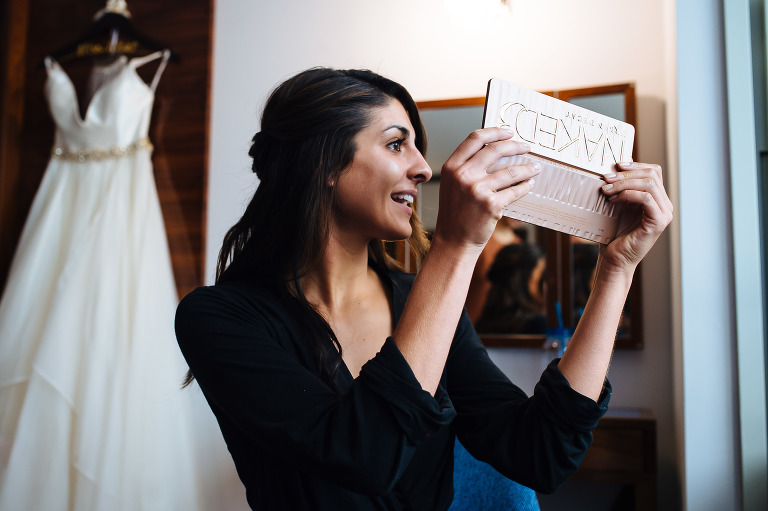 I love capturing wedding couples opening gifts from their partner on their wedding day, and I especially love photographing the reaction shots as they read the notes that are included. The sometimes humorous, but always heartfelt, notes always get great reactions that are great to look back on. When else would a spontaneous Spice Girls dance-off happen between the bride and her sisters? That happened this past weekend as Alisha was about to put her wedding dress on. One of her sisters played “Wannabe” and they just started going crazy singing and dancing along. Sure, awesome moments happen at the reception and the ceremony too, but the ones that unfold while you’re getting ready with an intimate crowd are definitely of a different variety. There were 5 great reasons why you should start your wedding photography from the beginning of the day. I think capturing elopement getting ready photos is very important because it allows me to tell your wedding story from the start! So whether it’s just the two of you or you and a small group of special guests, include this part of your day in your elopement photography. You won’t regret it. Wondering where to stay for all of these great elopement getting ready photos? Check out my guide to three great elopement hotels in NYC.